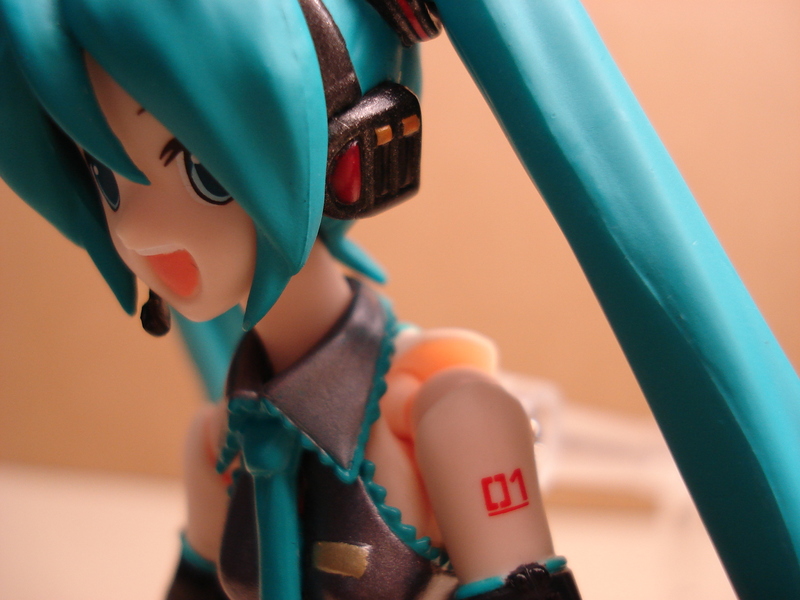 Miku is a very special figma that is not like any of the previous figma lines. First things first though, and that’s what she comes with. Naturally she comes with a stand, bag and the standard set of bonus hands. I actually have the faces swapped in the image, she comes with the smiling face equipped, and the singing face is the extra face. 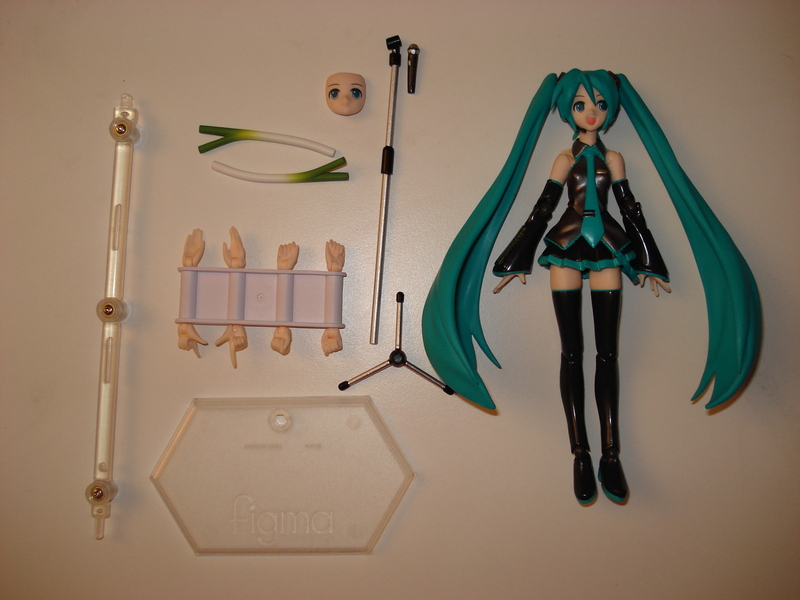 Also included is a 3 part mic stand, with the tripod base removable from the stand itself, and the microphone holder removable as well so Miku can hold the stand if neccessary. 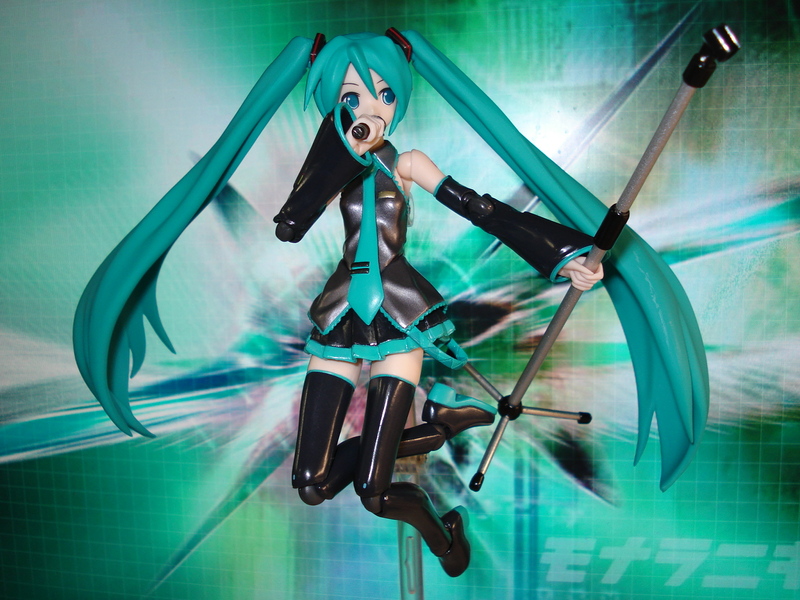 The microphone can be removed so Miku can hold it in her hand as well. 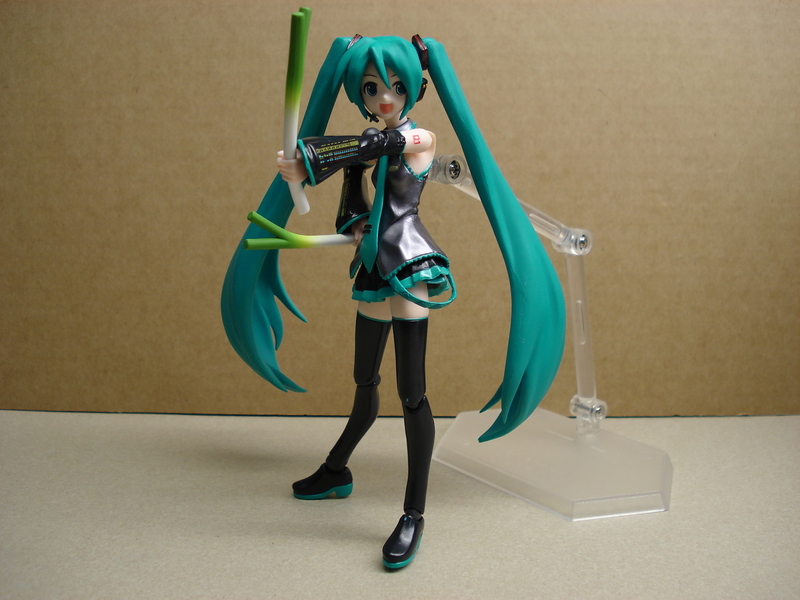 Lastly she comes with a pair of leeks that she can wield like short swords or daggers. 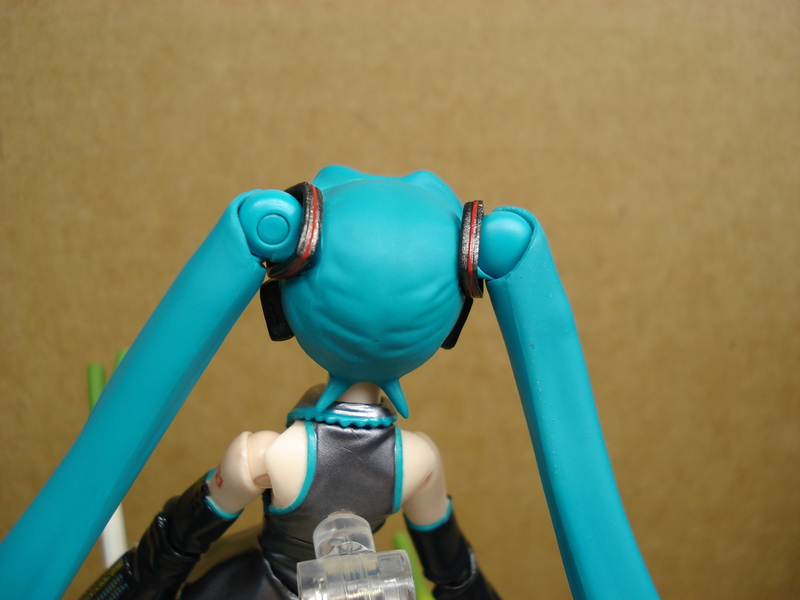 This means that Miku’s twin-tails have more freedom of movement than the other characters. Granted, her twin-tails are considerably larger than Kagami’s, Tohsaka’s, Nanoha’s or Fate’s. 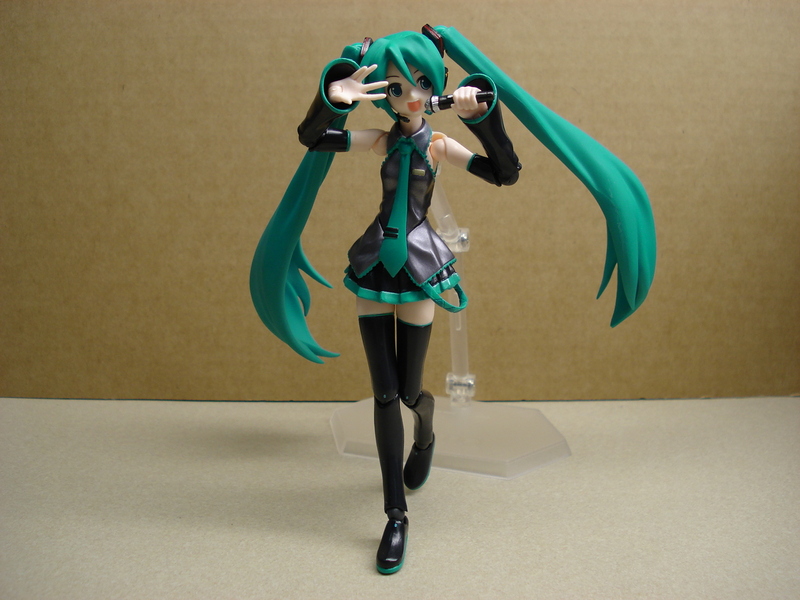 Being able to position her twin-tails allows you to give her a larger degree of personality to her poses. 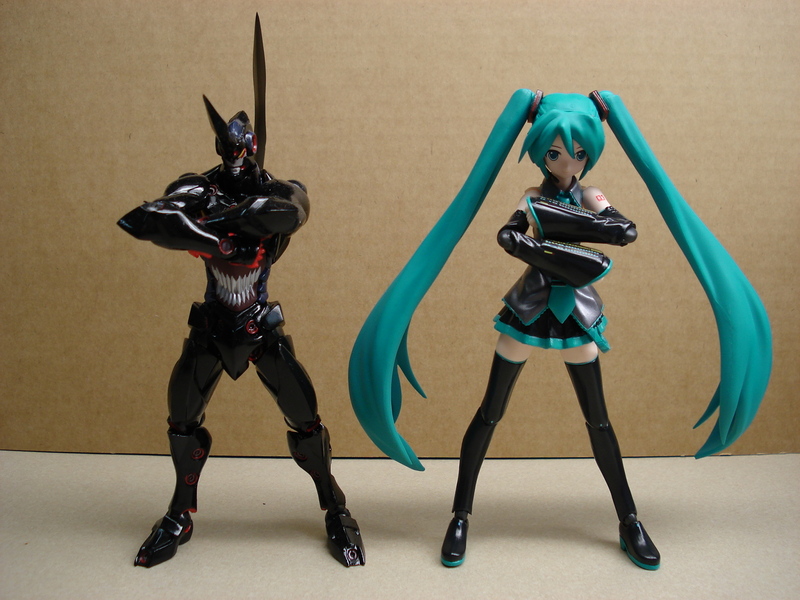 Pros: Because she has bare shoulders, Miku has a greater range of movement in her arms than the other figmas. This makes posing ridiculously easy, as you can get her arms into almost any position that you can think of. The stand hole in her back seems to be considerably deeper than the other figmas as well. Cons: At the other end of her arm is one of the cons of this figma. 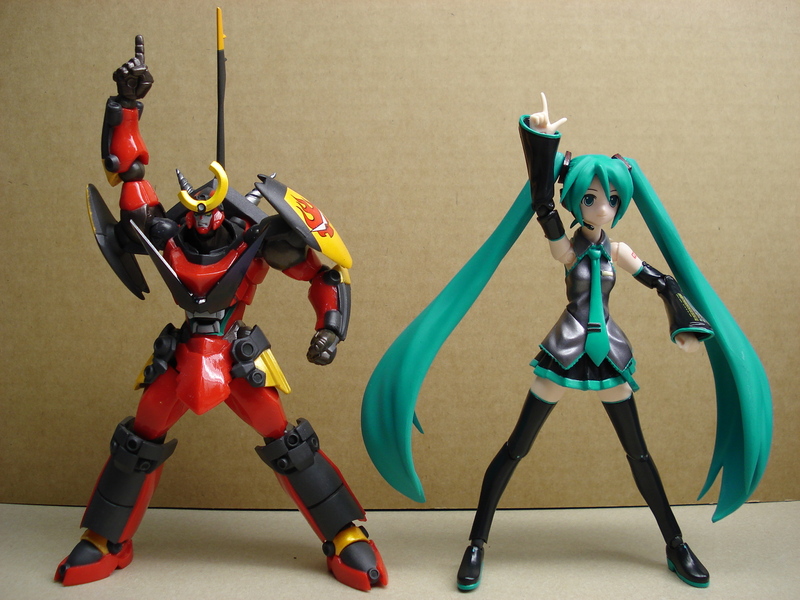 Miku has an incredibly elaborate costume, and as such, her sleeves cover up her hands. There is a deep recess there the peg hole for the hands are, and this actually limits the amount of movement for her hands. A common problem for figmas is the bangs, which tend to be loose on many figma. 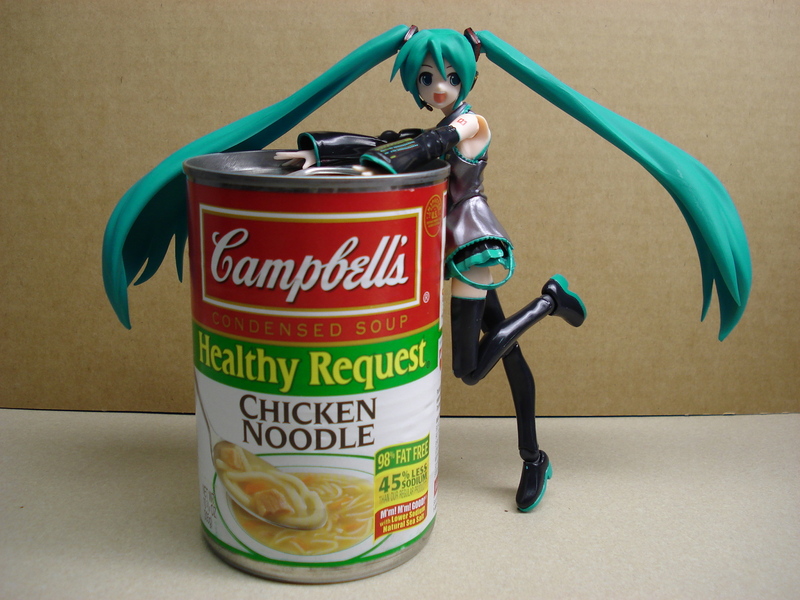 Such is the case with Miku, and you’ll find yourself picking her bangs off the floor more often with her than other figmas, especially if you like posing her and changing her face. Speaking of her face, since her alternate face is looking left (as opposed to other figma who have faces facing right) you’ll find yourself posing her facing left than right most of the time. 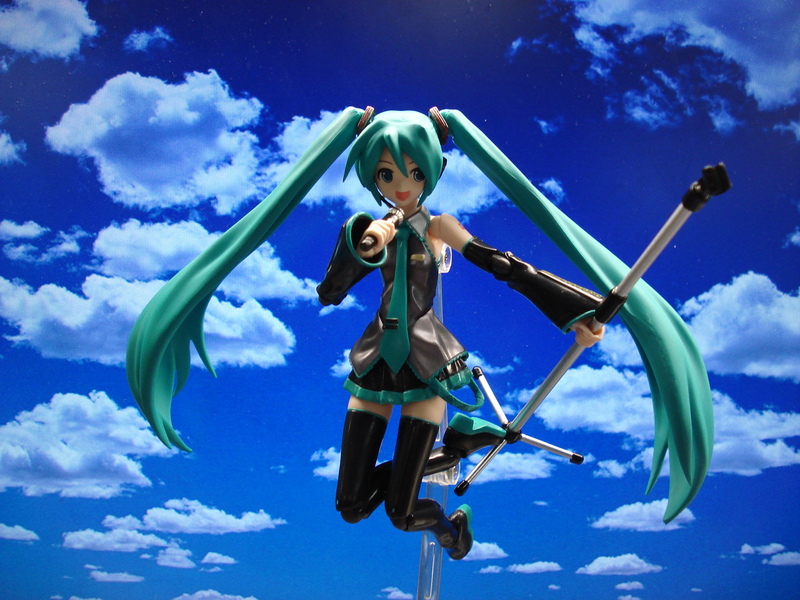 Miku will cost you around $25-30 before shipping and taxes. When I bought her a few weeks ago, I couldn’t find anyplace online that was selling her. I ended up purchasing her off eBay for around $45, but haven’t regretted it since. The figma line seems to be gaining a lot of popularity lately, especially for popular characters like Haruhi, Saber and Kagami. To finish off this review, I thought I’d treat you all to a music video I found on youtube that was done with the Vocaloid 2 software using Miku’s voice of the song Interstellar Flight (Seikan Hikou, 星間飛行) from Macross Frontier and the origin of Ranka Lee’s kira (キラッ☆.) Enjoy! Nice review. 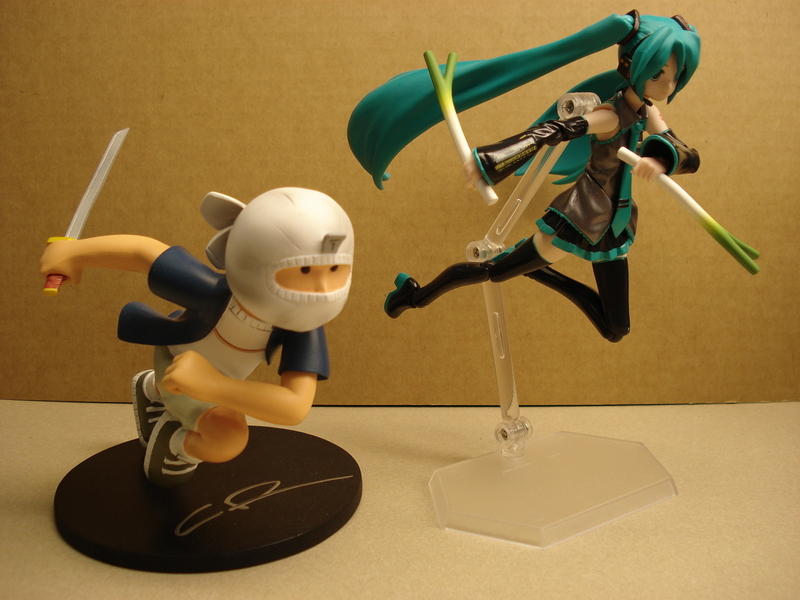 I wish I have a figma Miku too. 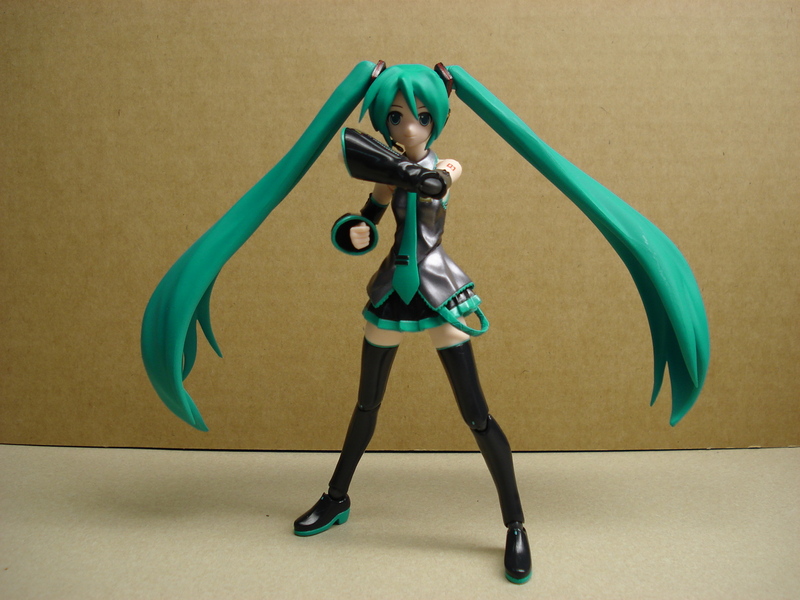 I just got Miku a couple of days ago – no, it doesn’t seem to have the normal chest joint. 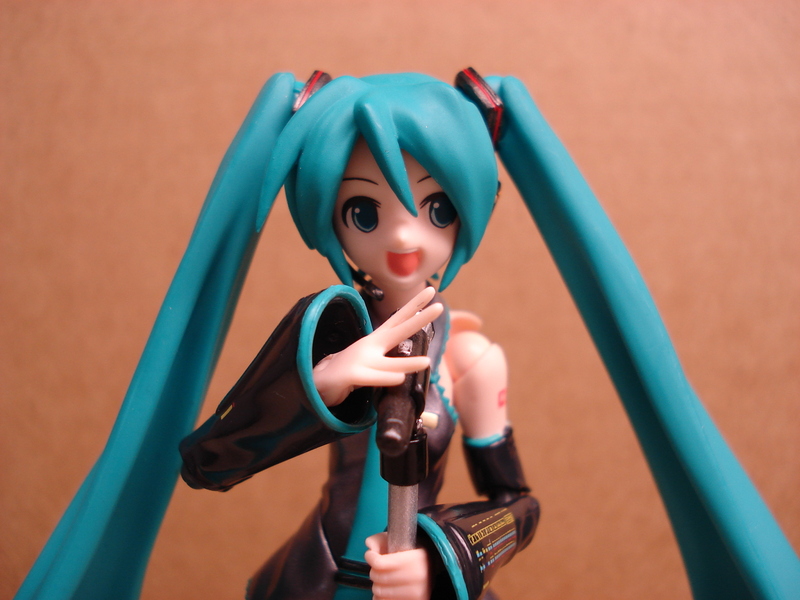 It looks like that face will come with the WonFes Summer 09 di:stage Miku figma with the keyboard. cool vidio teh ting is bout the figma miku is dat her front skirt and lower blouse can come off but im not sure bout the back.